This week, my dad celebrates one of those birthdays than ends in a "0." Usually, for birthdays, my family celebrates by dining out. A birthday that ends in "0" is cause for a more special than usual place. My mom & I debated a lot, should there be a surprise party, where should it be, or should there be a dinner out and if so just us or invite other people, too? 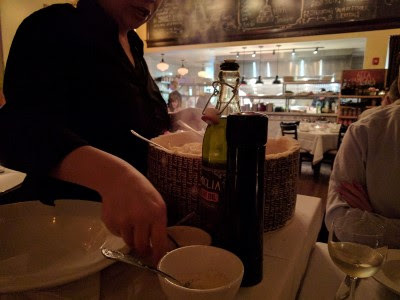 In the end, we decided on mom and dad plus me & SP dining at Arlecchino. SP & I really like Arlecchino. We hadn't been there in over a year. Mom & dad had not yet been there but did dine there many, many years ago when it was The Classroom Restaurant. our new favorite appetizer at Arlecchino. The next course was a salad, served family style, with beets, golden raisins, and sunflower seeds. I didn't take a photo. Following the salad, the pasta course is served. As on our prior visits, there is Fusilli a la Vodka. 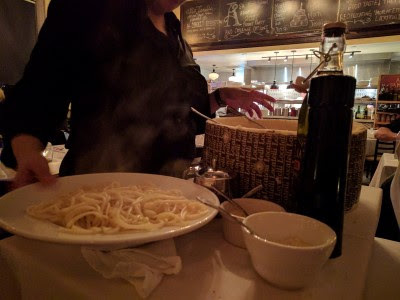 New to us is another option: a Cacio e Pepe pasta made tableside. 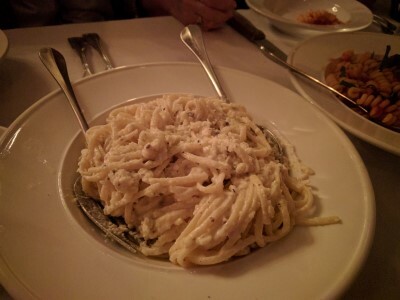 There is an extra charge for the cacio e pepe pasta, but it's worth it. A bowl of pasta noodles. 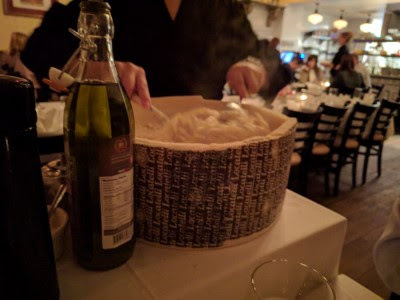 A mostly hollowed out locatelli cheese well. The noodles are placed int he cheese wheel bowl. Then salt, pepper, romano, olive oil, and cream are added and everything is tossed together. So. Good. Dad and I liked this best. 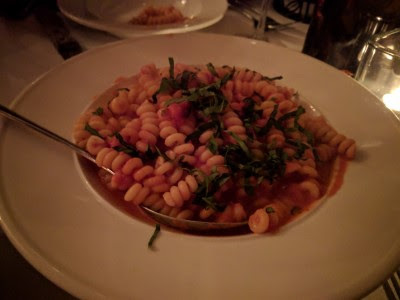 SP & mom liked the fusilli a la vodka best. Yes, rich and salty and cheesy and not healthy but oh so tasty. 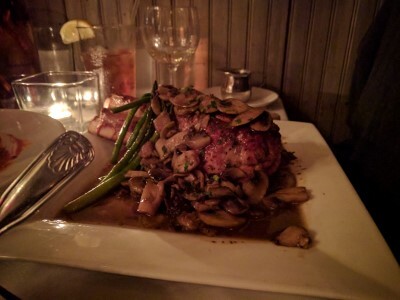 For mom, Bistecca Diane (prime aged sirloin, chargrilled and presented with caramelized onions and wild mushrooms in a light Worcestershire butter, finished with shaved locatelli). She said it was very good, lots of mushrooms. 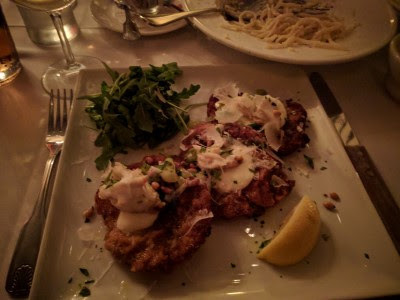 For the birthday boy, the house specialty: a double cut veal chop from milk fed Wisconsin raised young cattle prepared Milanese style (paddled, pan fried in clarified butter, baked in the oven, finished with kernels of colossal lump crab, toasted pignoli, lemon scallion butter). 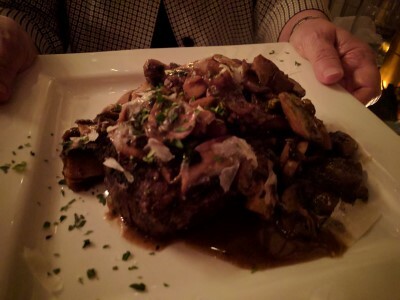 Dad said it was excellent, probably the best veal he's ever eaten. 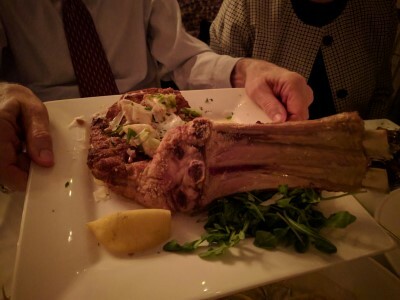 SP always talks about ordering the veal chop and this time he did, choosing the Griglia preparation which had a mountain of mushrooms and some asparagus. He said it was very good. I snuck a mushroom and it was a very good mushroom. 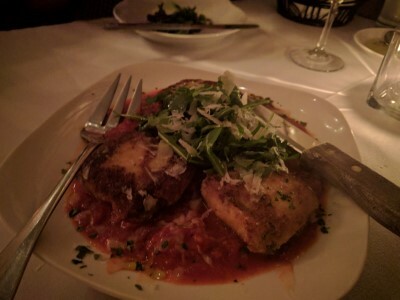 I ordered my usual: Cottoletta del Monzu (scallopini of veal finished with fresh mozzarella, colossal lump crab, arugula, and toasted pignoli). I love this dish and still think it's the best veal I've ever eaten. 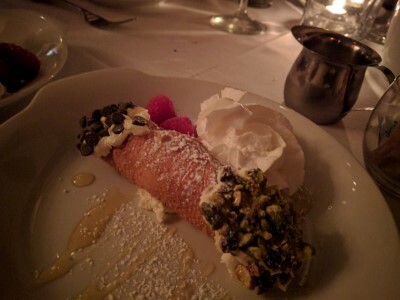 I also ordered the Cannoli. I don't see it often on dessert menus here so I like to order it when I have the chance. We ended up bringing half the cannoli home. 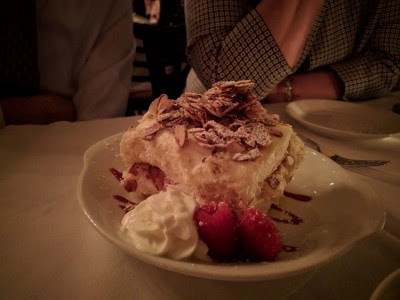 My parents really enjoyed their meals at Arlecchino. I'm glad because whenever you tell people how fantastic and delicious a restaurant is and then they go, you want them to think it's as good as you said. I think my dad may have said it's the best meal he's had in Pittsburgh. Dining at Arlecchino is an experience, it's not in & out. It's nicely paced, on the leisurely side but not like you're waiting and waiting. More like experiencing and anticipating and enjoying. Our server was great. We never felt rushed, not even when we took a bit to decide what beverages to order. Still one of our favorite places in Pittsburgh. And definitely the best veal.